Easyjet operates 2 versions of Airbus A320. This version of Airbus A320 operated by Easyjet may transport 180 passengers. EasyJet designates the seats of the 1st row as XL seats. 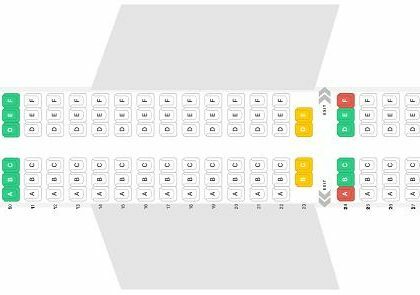 The price of these seats is higher because these seats have some benefits, among which: priority right for check-in and boarding and extra legroom. However the bulkhead located in front of the seats 1DEF limits movements of passengers’ legs. Also passengers report that during the flight it may get cold on the seat 1A. Among other disadvantages: close location of the lavatories and galley, lack of floor storage during take-off and landing and reduced width of the seats as they tray tables are in the armrests making them immovable. Because of the exit row located behind the seats of the 11th row are less reclining than standard. Due to the fact that the seats of the 12th row are located between two exit rows, these seats on the one hand have extra legroom but on the other have limited recline and no under seat storage. These seats are designated as XL seats that offer the right of priority check-in ad boarding. 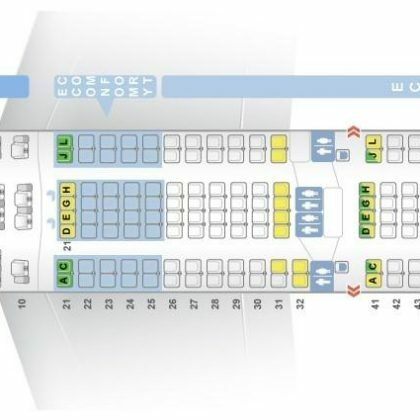 The best seats on this airplane are considered the seats of the 13th row. Passengers of these seats will take advantage of extra space for their legs, Speedy boarding pass and priority check-in and boarding. These seats are also designated as XL seats. The only disadvantage of these seats is limited under seat storage. Other passengers tend to gather in the area of the seats 29DEF, 30C and 31ABC while waiting to use lavatories and thus causing discomfort to passengers of these seats. Also the seats 31ABC have such disadvantages as reduced width and missing window. That is why these seats are considered bad seats. Second version of Airbus A320 may accommodate 186 passengers. All the seats on this airplane are the seats of economy class that do not recline. Passengers of this airplane may reserve the seats in advance for an extra charge. Seats that offer additional legroom have higher price but give speedy boarding pass. The airplane contains 31 rows of seats that have 3-3 configuration. Passengers of the seats of the 1st row will take advantage of extra legroom. These seats are designated by EasyJet as XL seats that provide dedicated check-in and priority pass for extra charge. However, these seats have some disadvantages: passengers may get cold during the flight by the exits, close location of the lavatory and galley may be bothersome, reduced width because the tray tables are in the armrests making them immovable. The only disadvantage of the seats of the 11th row is limited recline. The seats of the 12th row are designated as XL seats. So, passengers of these seats will feel comfortable thanks to additional space for their legs. These seats have no under seat storage. The bests eats on this airplane are considered the seats of the 13th row that are also dedicated by EasyJet as XL seats as they have extra legroom for passengers. The main disadvantage of the seats 30C and 30 D is location of the lavatories behind. No windows, the noise from the lavatories located behind and immovable armrests that reduce the width make the seats of the 31st row bad seats.